Last weekend we went into town for breakfast and errands, and while we were out and about we decided to visit a local tile store to see what they had to offer for our master bathroom. After months and months (and months) of research, I happen to know the specifications of pretty much every tile that Lowe's, Home Depot and the Tile Shop sell, but I don't often have the opportunity to visit specialty stores in person. I was excited -- this was a treat, and we like to support local businesses whenever we can. When we walked in, we saw a really nice selection of slate that would've been perfect in our entryway. I had a good feeling. And then we met the tile man. I told him the tile I'd wanted for my bathroom was discontinued and asked if he knew of anything similar. He searched through his giant catalogs and found something pretty close. I got a little jumpy inside. But then he quoted a price that was more than double what the original tile would've cost. Same materials, same specs, same everything. When I regretfully told him that was outside our budget (and I was truly regretful), he instantly bristled. Ez and I continued to look through the selection, talking through ideas. 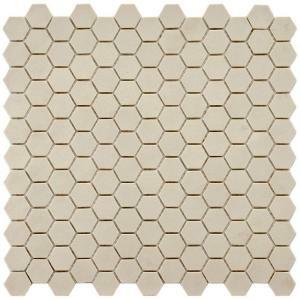 We found a porcelain hex tile that was somewhat convincingly glazed to look like marble. I asked the tile man more about it. "That's going to be way out of your price range," he said. "It's $22 per square foot." "Then go for it," he said coldly. And that was pretty much how our specialty tile store visit went. High prices, low friendliness. I tried not to be rude when talking about prices, but the fact I didn't come in with an unlimited budget was really the nail in that coffin. We took some information about some overpriced slate and went home. I placed my tile order at Home Depot that afternoon. Though they no longer carry the 2" hex I wanted, they did have the 1" in the same color -- it wasn't what I had really wanted, but I could be happy with it. (After four tough years of renovating this house, I've learned to be content with "good enough.") I stood in the master bathroom and stared at the sample for a good 15 minutes. I compared it, side-by-side, to this one from the Tile Shop. I made Ez come in and close his eyes and envision what he'd want the perfect, relaxing shower to look like (taking into consideration our bathroom has zero natural light coming in). I think when it's paired with a darker grout, a teak bench, and some other details we have planned, we'll be quite happy with it. Compromises and all that... After all, it's the tile I wanted, just on a smaller scale. I've been following long for awhile but never comment, but I wanted to say I like the tile you chose. It is different from what I see a lot of, but still classic. I hope it works out for you. I guess he was most likely not the owner. Happy you're set with tile. I hope he wasn't the owner. If he was, he probably won't be owning a store very long. I'm not usually surprised by poor customer service, but usually small businesses treat you well. He made no effort whatsoever to convince me that his more expensive products were the way to go. Oh well. His loss. My guess is that he might be one of those small business types that just has a total chip on his shoulder about larger chain stores selling things for cheaper, which, you know, he just really needs to get over it and not totally ruin the things he can do better than a large chain store, like really personalized service. I like supporting small businesses too, but there are non-evil reasons that large chains are successful, after all. I'm glad you were able to find some tile you like! I remember the post where you were kicking yourself for waiting too long on the 2" hex. Been there, done that! We've got a specialty tile shop here in town that sounds a lot like the one you visited. They're prices are outrageous and I'm not sure how they stay in business, but at least you were able to make some compromises and found the look you were going for! I need to learn to trust my gut more! I should've jumped when I had the chance. But oh well--this will be nice too, I think! Thanks for the note.